The first official image from BBC crime drama Sherlock is here at last and — stop your panting and hyperventilating, fan girls — it paints a reservedly emotional picture of what to expect from the upcoming third season. And hoo boy are we excited for what’s to come. While stark in its composition, calling to mind the stark yet evocative works of artist Dennis Hopper (anyone a Nighthawks fan? ), particularly his 1927 painting Automat in addition to the aforementioned ‘hawks. 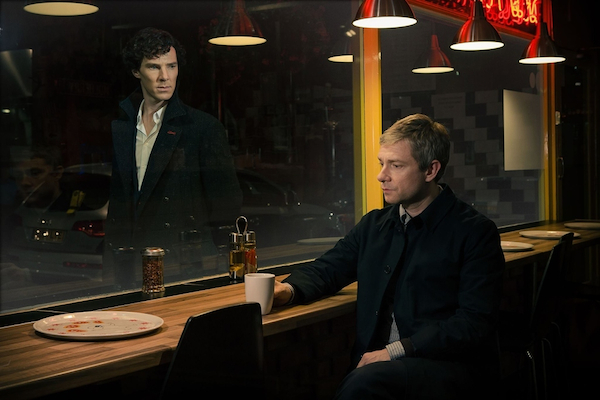 The image sets up the dynamic between Benedict Cumberbatch’s Holmes and Martin Freeman’s emotional John Watson, highlighting the invisible wall between them. See, you guys? They’re both living in a glass case of emotion (only one side has tea)! Using glass as a metaphorical and literal boundary — I see what you’re doing there, creator and executive producer Steven Moffat! It’s a stark but brilliant image: Watson, none the wiser that Holmes is just out of sight but in plain view, watching his friend’s dejected emotional tailspin. After losing his best weirdo bud — or so Watson thinks — it’s no wonder he looks so crestfallen. And considering both Sherlock and the viewer aware that Watson’s about to have his preconceived notions shredded, there’s a lot of charged energy behind both actors. Clearly, it’s going to be an electric meeting between both parties. And by electric we mean “probably filled with swear words and angry posturing.” Decorum be damned! For those who somehow managed to forget the details (is that even possible?) surrounding the season two finale “The Reichenbach Fall,” here’s a quick refresher: Sherlock Holmes somehow managed to fake his own death as a way to end the ongoing saga between himself and Moriarty (the delightful Andrew Scott), who the audience last saw shooting himself in the head. Ow. Watson saw him dead and now everybody’s feelin’ the womps. Dark times ahoy! But that doesn’t mean there’s going to be any lack of villainy for the oncoming storm of Sherlockiness: indeed, NBC’s version of Hannibal Lector (Mads Mikkelsen) seems to have a literal and equally-as-scary, villain-y brother Lars Mikkelsen, who will play a (so it seems) take on classic Holmes villain Charles Augustus Milverton. Though the thoroughly modern Milverton goes by the last name Magnussen these days, it seems to point to a game of blackmail in Holmes and Watson’s future. Also continuing is the series’ format: as the previous two seasons were made up of three, 90-minute episodes a piece, season three will follow suit, with episodes titled “The Empty Hearse,” “The Sign of Three,” and “His Last Vow,” according to producer and writer Mark Gatiss. The synopsis for most of these episodes is largely unknown, thanks in part to producer Sue Vertue who pleaded with the series’ rabid fan base (that’s putting it lightly) to not spoil the mystery of it all with tweets and other social media doings regarding location details. Sherlock returns to U.S. airwaves via PBS on January 19th at 10PM (following Downton Abbey, so tell all your anglophile friends). And while they’ve yet to announce a start date in its home country, the BBC has ensured that the season would air ahead of its American counterpart.